The Living Shoreline is comprised of 11 Sculptural Elements that are designed to retain soils to support the growth of mangroves and emergent grasses, create shelter and passage for fish, and establish oyster reef habitat within the Lake Worth Lagoon. This concept is a truly innovative approach to public art in which the artwork is created as an armature to support the regeneration and enhancement of critical estuarine habitat. The Living Shoreline will ultimately assist in improving water quality, it will protect the adjacent bulkhead seawall, public park, and infrastructure (including from early sea-level rise impacts), and it will support the restoration of habitat. Critically, it will do this in a manner that engages the broader public to witness the regenerative transformation of a barren seawall to support shallow water estuarine habitat through a piece of public art. 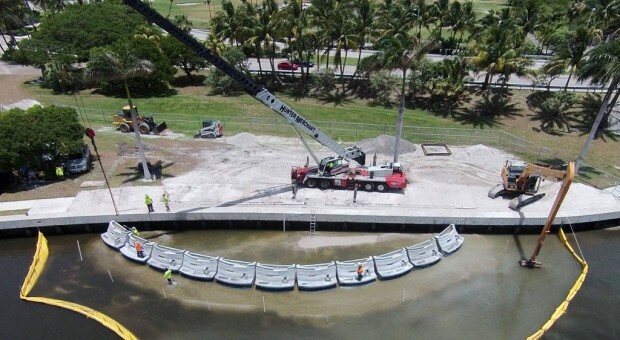 The Living Shoreline is a collaborative project with the Palm Beach County Department of Environmental Resources Management (ERM) and engineer of record, Bridge Design. Michael Singer Studio began collaborating with ERM in 2005 during the design of the downtown West Palm Beach Waterfront Commons. The Studio was interested in creating new estuarine habitat that would help improve water quality in the Lake Worth Lagoon (the body of water that the Intracoastal Waterway runs through in Palm Beach County) while offering the general public and tourists a unique way of interacting with the water and native habitats within an urban environment. ERM provided helpful consultation on the Michael Singer Studio design for the Living Dock. The Studio and ERM also collaborated on the design of transitional waterfront edges and the creation of new habitat islands which became known as the South Cove. ERM ultimately engineered, permitted, funded, and built the South Cove, which was completed in 2012. Nearly 90% of the Lake Worth Lagoon has an artificial shoreline composed of either vertical bulkheads that provide no shoreline protection or habitat value, or rip-rap (stacking rocks) that provide some protection and habitat value, but still lacks the function of a natural, living shoreline. Native mangrove and cordgrass salt-marsh vegetation act as shoreline and sediment stabilizers, and increase ecosystem services to the community by improving habitat for commercially and ecologically important fish and other wildlife. During the West Palm Beach collaboration Michael Singer Studio and ERM began discussions on creating sculpted living shorelines instead of utilizing the standard limestone rip-rap (which was used for the South Cove and many other ERM projects). The concept was to create functional sculptural elements that would retain soils for mangroves while also performing other ecological functions such as fostering oysters and creating passages and shelter for fish. The goal was to find a way to not only create a more environmentally functional and aesthetically beautiful design, but also create a design that could compete economically with the standard rip-rap alternative. The discussions ultimately led to a joint application to the National Endowment for the Arts (NEA) grants program, Art Works, to fund the design and creation of a Sculptural Living Shoreline prototype for a small demonstration study. The NEA agreed to fund the project in 2013 with matching support from ERM. In the summer of 2014 Palm Beach County increased its support for the project to fund the creation of a full 100 linear foot Living Shoreline mangrove planter comprised of 11 Sculptural Elements. The site for this innovative Living Shoreline Mangrove Planter is at the northern end Bryant Park in Lake Worth, Florida, adjacent to Snook Islands Natural Area created by ERM in 2005 and expanded in 2012-2014. The project was completed in the summer of 2015. Flexibility and Maximizing Habitat Creation: The Sculptural Elements are designed to rotate in plan to form an arc, in order to maximize the total area of planted mangroves and spartina, which in-turn maximizes the habitat area. The arc size may vary, allowing for the creation of large or small mangrove planters depending on the number of Elements utilized. Material and Energy Efficiency: The Sculptural Elements retain soils for the mangrove planter with less material, less on-site installation time, and potentially less embodied energy than the standard limestone rip-rap alternative. Optimizing Oyster Habitat: Oyster habitat is optimized with an integrated “oyster shelf” built into the Sculptural Elements, set at the preferred elevation to foster growth. The shelf also functions as a ledge for sheltering fish such as Snook that prefer shaded locations. Experimental Textures for Fostering Oysters: Sculpted patterns/ textures will be tested on the oyster shelf to see if certain types of textures are optimal for oyster formation. Experimental Fish Passage to Improve Habitat Access: The Sculptural Elements integrate an adjustable fish passage that will be studied and improved upon over time, with the goal to allow for the free movement of aquatic life in and out of the mangrove planter. The existing rock rip-rap design typically does not allow for fish passage. Engaging the Public Through Art: Living Shoreline creates an aesthetically considered edge that engages the public as a work of art, with the possibility of creating ‘local’ variations for different communities and sites. Integrated Planter to Soften the Edge: The integrated top planter will help to visually break-up and soften the Sculptural Elements with native coastal flowering plants when they are first installed, prior to the growth of the mangroves and emergent grasses. Wave Attenuating Design: The Sculptural Elements are battered (angled back) to resist wave action while absorbing and dissipating some of the energy and reducing turbulence compared to a vertical seawall, which will improve seagrass recruitment waterward of the structure. Improving Upland Defenses and Anticipating Sea-level Rise Impacts: The Living Shoreline creates two additional lines of defense against storm surge and flooding. The Sculptural Elements (which act as a retaining wall) and the red mangroves both absorb wave energy and protect upland areas. This should increase the lifespan of the adjacent seawall and also help mitigate some initial impacts of sea-level rise. Economically Competitive: When built in mass quantities, the Sculptural Elements should be cost competitive with the standard rip-rap alternative. To view the full design document please click here. This project has been funded with generous support from Palm Beach County and The National Endowment for the Arts, Art Works Program. Thanks to all of the volunteers that planted over 2000 spartina grass plugs and over 700 sea purslane, sea oxeye, and railroad vine in the top planters. The project has also received international press. See coverage in Reuters here. Bridge Design Associates Inc.: Brian Rheault, P.E., Chris LaForte, P.E.